Corsair makes a stab at an RGB microATX cube. There’s a lot of neat features to keep us happy here. But that oversight on the 24-pin cable is just too much of a mistake for us to let go. 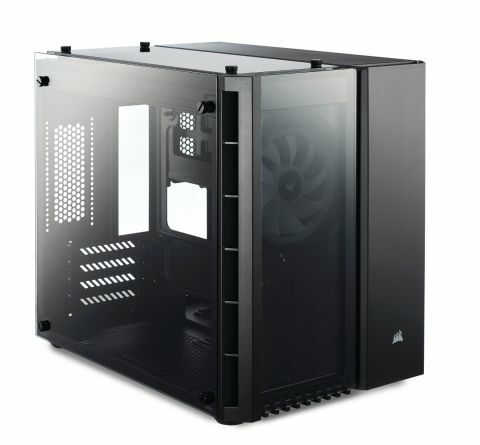 Take a look at Corsair’s arsenal of cases (several of which made our list of the best PC cases), and you’ll see there are more than 25 different chassis in the mid-tower ATX sector alone. Compare that to the microATX segment, where there’s five. Yep, that’s it. So, when a new microATX case launches from the Californian giant, you can bet your backside we’re on the scene to review it first. The Crystal 280X is very much a revision of one of that small group. A much-needed update of the first and still impressive Carbide Air 240. Originally, the 240 was a shrunken variant of the Air 540 series, a compartmentalized cube, designed to allow for better temperature control and easier build access. From the outset, the 280X takes the best of Corsair’s Crystal series and bakes it into a new variant of the fabled micro cube design. With added tempered glass now adorning the front panel, roof, and side, there’s no denying how classy it looks. Done badly, tempered glass can seriously restrict airflow, but Corsair has seemingly dodged that issue pretty well. The front panel is a completely solid single piece of glass and plastic; there’s around 20mm of clearance between it and the front intake fans (covered by a magnetic dust filter). Turn your attention to the top, and a single pane of glass sits on a set of spacers, elevating it off the recessed dust filter, designed to provide plenty of additional airflow for those exhaust fans you’ll be installing in the roof. Speaking of cooling, as standard the 280X comes with two 120mm RGB fans, one mounted in the front, and one in the roof, connected to an RGB controller unit in the back of the case. As far as storage is concerned, that back compartment supports two 3.5-inch drives, accessible via a small honeycomb door located at the back of the case, near the rear I/O, with a further three 2.5-inch drive bays situated at the front. Aside from a full-size ATX power supply, you can also mount an additional 120mm fan on the rear side panel, too, presumably to draw cool air in to chill those 3.5-inch drives. Spinning back around to the front compartment, where the majority of your hardware will be installed, and we can see there’s room to support up to a 240mm radiator in the front, one on the floor, and one in the roof. At first glance, it all looks rather good—however, the Crystal 280X falls down on two major points. This really should have been pitched as an ITX case. Install that small form factor motherboard into the 280X, and you can see there are plenty of rubber grommets in place to allow for your mobo cables to pass through anywhere you like easily enough. Opt for a microATX board, on the other hand, and what you’re left with is a single rubber grommet cable pass-through situated on the bottom-right of your mobo. There’s nothing above it, because it’s blocked off by the 2.5-inch drive caddy in the other compartment. There’s no obvious cable routing solution, either. If you’ve got a microATX motherboard with a 24-pin port situated anywhere other than right in the middle, there’s only one choice: Run it straight up from that bottom-right grommet—and it looks bad. Then we have the dust filters. The ones located on the rear side panel and on the bottom of the chassis are fine; what you’d expect from a dust filter—securely magnetized in place. The ones behind the tempered glass panels, however, only have large triangular magnetic pads on each corner, and two trapezium-shaped ones in the middle to help hold them down. It’s not enough—they feel flimsy, and if placed incorrectly, can bubble up the mesh, ruining the overall aesthetic and premium feel of the whole affair. It’s a shame, because if it weren’t for those gripes, there’s a lot of neat features to keep us happy here. But that oversight on the 24-pin cable for microATX motherboards—in a case that’s predominantly designed to be a microATX chassis—is just too much of a mistake to let go.